Augmented reality (AR) head-up displays (HUDs) will completely change the driving experience by overlaying critical driving information onto the real world. The best example of an AR display today is found in fighter jets, which places a wealth of critical information in the pilot’s direct line of sight. In an automotive environment, instead of issuing basic warning tones or symbols, graphics placed directly in the driver’s line of sight will convey information and identify threats in their field of view, enabling them to take immediate action. The graphics appear as a natural, conformal extension of the real world; they are not just a secondary display of information as found in today’s HUDs. As discussed in my previous blog post on solar loads, solar irradiance poses a significant challenge for AR HUD designs. Unlike traditional HUDs, AR HUDs have a very wide field of view and a long virtual image distance, and require real-time integration of the vehicle’s sensor data with the HUD display. 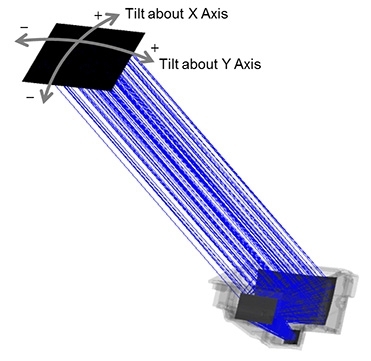 The long virtual image distance (>7m) and to a lesser extent the wider field of view (at least a 10 degree angle horizontally by a 4 degree angle vertically) result in a significantly greater concentration of solar energy, and a corresponding heat rise at the imager panel. In order to prevent thermal damage from solar irradiance, you must carefully design your AR HUD and run detailed solar-load simulations to verify reliable operation. Here are a few points to consider when modeling the effects of solar load on an AR HUD design. While it may seem obvious, I can’t overstate the importance of accuracy in your model’s elements. AR HUD solar load simulations require an accurate sunlight source model with proper angular, spectral and irradiance characteristics, as well as accurate spectral transmission curves for optical elements in the car, including (but not limited to) the windshield, glare trap and hot/cold mirrors. During everyday driving conditions, a wide range of sunlight angles enter the car as it turns and tilts up and down hills. Therefore, it is important to scan the incoming sunlight across an appropriate range of angles, as the example shows in Figure 1. TI found the off-axis peak solar irradiance to be 2.7 times worse than chief ray levels in our AR HUD prototype using TI DLP® technology, resulting in significantly more thermal loading. The peak solar irradiance from the simulation is shown in Figure 2. If you don’t design your system to handle the worst-case off-axis solar irradiance, you run the risk of unacceptable field failures from damaged imager panels. Figure 2: Peak irradiance on the diffuser screen as a function of input sunlight angle. Simulating peak solar irradiance is only the first step in predicting and avoiding thermal failure. Solar energy converts to heat based on the spectral absorption of the material onto which it falls. 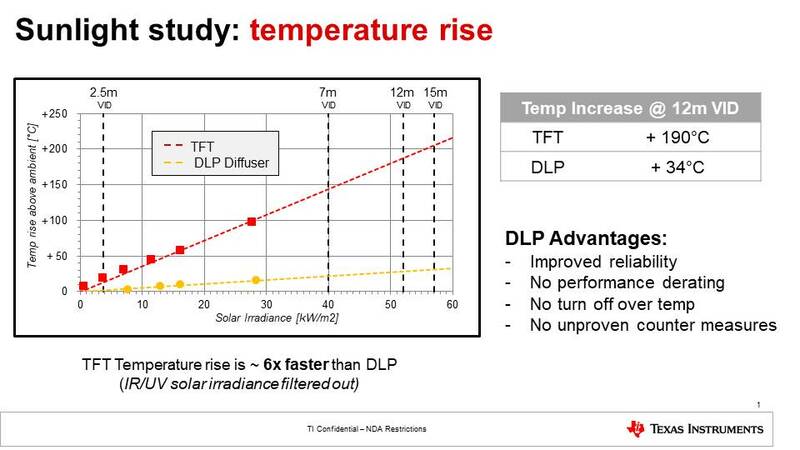 For example, in our testing, illustrated in Figure 3, the temperature rise of a thin-film transistor (TFT) panel due to solar load increased 6 times faster than the transmissive micro lens array diffuser screen used in DLP technology-based systems, making the TFT panel much more susceptive to damage from solar irradiance. At an ambient temperature of 85°C, Kuraray diffuser screens found in HUD systems with DLP technology can withstand up to 82kW/m2 of solar irradiance, due to their low spectral absorption and high operating temperature. This thermal performance enables DLP technology to support the long virtual image distances found in AR HUDs. Download the DLP5530-Q1 data sheet. Learn more about DLP technology automotive chipsets on the Enlightened blog. Start designing your AR HUD with the Electronics and LED Driver Reference Design for Augmented Reality Head-Up Displays reference design and the DLP3030-Q1 or DLP5530-Q1 chipsets. Nice job explaining why solar load is so critical on a AR HUD design!